This page can not do justice to imitations of Carausius. I hope someone else will write such a page and I can link to it from here. Write and let me know if you know of a page with Carausius imitations. 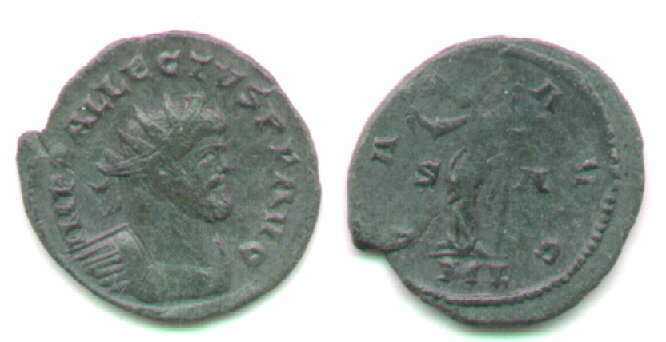 Imitations of Carausius are common, and vary in style from crude to almost official. Dave Tranbarger wrote to the Moneta e-mail list (May 16, 2001), "I believe there is some controversy as to the line of distinction between barbarous and official Carausian coins. The module of Carausian copies never descends to the level of true minimi. Thus, these copies are not classed with the "barbarous radiates" or other episodes of epidemic counterfeiting. The remaining options then are to either class the coins among endemic counterfeits or to assign them to the earliest period of Carausius' coinage, before his mints were fully and adequately staffed with skilled workers." Imitation: 23 mm. 6:00. 2.90 grams. Prototype: 23 mm. 6:00. 3.41 grams. Pax standing with branch and sceptre, S to left, A to right, ML in exergue. Imitation has /P[AX] AAC, with S in field left and P in field right. The exergue has something close to "ML". The imitation is a full-size AE23, but thin and only 2.90 grams. The protype is also AE23 and 6:00, but 3.41 grams. References: Prototype: Sear 3587 (plate 10). RIC 28F, p. 561, plate XIX.9. 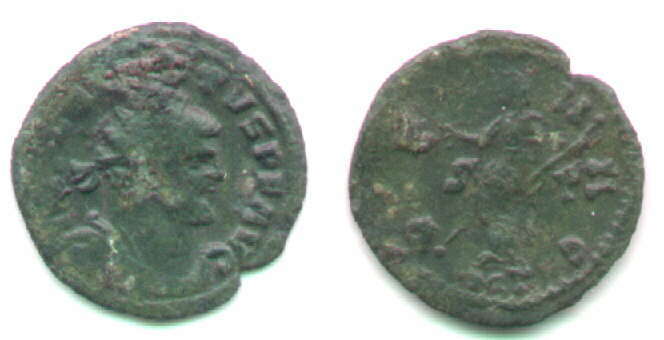 Kent, "Barbarous copies of Roman Coins," Limes Studien, page 64 states "Copies of Allectus are very scarce." Go to the next page, on Constantinian imitations. Return to the page on imitations of coins of the tetrarchy. Return to the main Table of Contents page on Roman imitations.